The recently concluded 11th Auto Expo showcased interesting trends. The Delhi Auto Show has established itself as the start of the automotive calendar." said Winfried Vahland, Chairman of Skoda Auto, on a visit to the city during the 11th Auto Expo. Whether this is truly the case can be debated, given that Detroit's North American ernational Auto Show starts in the second week of January. However, the enthusiasm at the hi biennial show could not be missed. Despite the gloomy weather, a host of automakers d the opportunity to showcase their new models and innovative concepts. 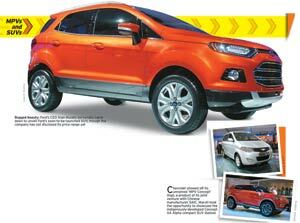 A clear trend was ble favouring small sports-utility and multi-purpose vehicles, as well as fancier two-wheelers.